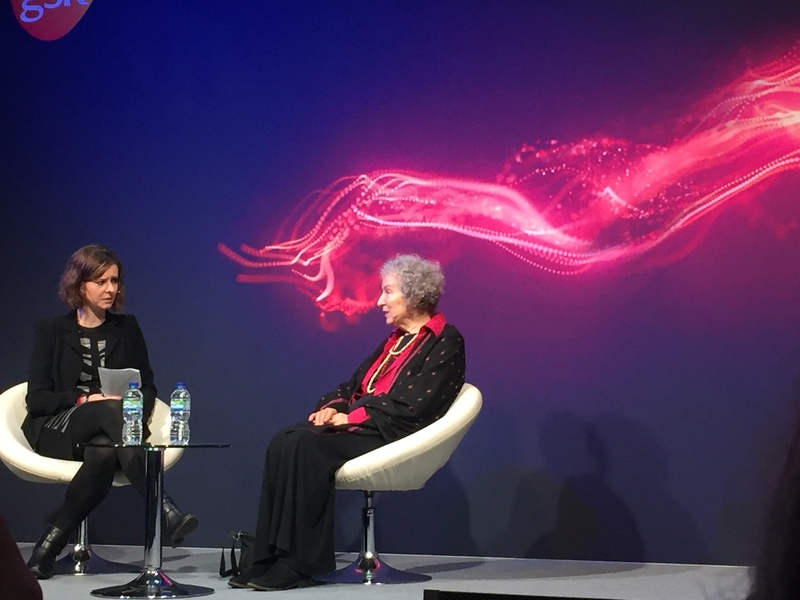 Margaret Atwood has always been a writer interested in scientific developments and the seemingly bottomless capacity for humans to be either truly inspirational or totally f**ked up. Unfortunately, as she discussed at New Scientist Live, she may no longer be a writer far ahead of her time, for it seems the present may be catching up with the author. The Handmaid’s Tale is speculative fiction. However, the dystopian future contains key ingredients that are with us today. Its sinister world suddenly seemed within touching distance for many the morning after the American presidential election in November 2016. Just months later, women dressed as handmaids sat silently in court months later to protest an anti abortion bill. A long-standing interest in extinction – especially human caused extinction – led to a thought experiment – what might bio-engineered people be like? ‘They wouldn’t need sunblock…therefore they didn’t need clothes. They can eat leaves and grass so there’s no need for factories and agriculture. They mate seasonally like mammals so there’s no rejected lovers. Transgenetic science developed in the late 1990s – 2000s and provided a rich seam of inspiration for Margaret’s imagination. Oynx and Crake may be closer to science fiction that her other work, yet Margaret revealed that when she went to a geneticist convention and gave them 3 real and 3 made up scenarios, the geneticists couldn’t tell what was made up. Genetically modified animals and crops is one of the biggest Pandora’s boxes in the world. How deep inside dare you go? In today’s fast-moving, uncertain, interconnected world, ethical dilemmas appear all the time. What role does Margaret believe speculative fiction have to play.? Stories can be fact or fiction – however, Margaret is very clear that she wants her narrative universes to remain firmly fictional.